Beautiful, fully machine washable girls special occasion dress in elegant matte silver with silver glitter tulle with wonderful twirl appeal. 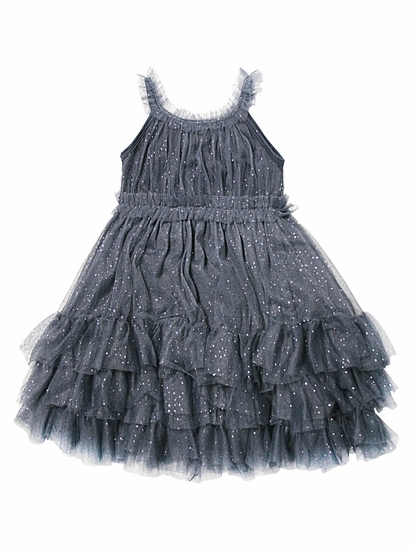 Sleeveless glitter tulle dress features ruffle straps and neckline and soft polyester jersey lining (super comfortable to wear for girls), with layers of ruffled tulle. Empire slightly raised waistline. Entire dress is fully machine washable - perfect for dress up, weddings, or any special occasion. Knee length on most girls. Machine wash cold; gentle cycle; hang dry Made in the USA.